This was intended to be by nixoncomedy, but I gather that the recent changes in the law over there have changed his small cottage industry overnight and he now has no spare time. So, I will have to fill in this particular gap, which is odd, as the game seems so long ago now. Certainly from Liverpool's point of view it is. Since our game with them, they have lost their mojo a bit, culminating with the 4-3 loss to Bournemouth as I write this. Looking back, I remember we drove to Southampton feeling slightly anxious, as for several weeks now Saints have had trouble converting the numerous chances created into actual goals. That was one thing that you could not say about Liverpool, but the general consensus was that it Saints could get in amongst their defence, there were enough cracks there to exploit. As far as we were concerned, Saints first choice back four of Cédric, Fonte, van Dijk and Bertrand were together again and didn't the team look better for it? As it turned out, that was probably just as well as Forster and his defence were up against it all afternoon (A 3pm kick-off on a Saturday? What's that all about then?) just look at those horrific stats in the sidebar - a pathetic 39% possession, a lone corner and not a single, solitary shot on target in the entire 90+ minutes. Having said all of that, Liverpool only managed two shots on target themselves. If you just looked at the stats, you would have thought that it must have been a boring game, but in reality it was anything but that. From the start of the game Saints might well have scored when Cédric got down the byline and sent a pinpoint accurate cross in, only to see Charlie Austin head wide. That was one of the only three shots all game. It didn't get any better. Liverpool were playing with three at the back, including the much loved ex-Saint, Dejan Lovren on the left of the three. That allowed the visitors to overload the midfield and this allowed Clyne to run at the Saints defence at will and make it a challenging afternoon for Bertrand. Saints largely managed to contain Liverpool during the majority of the first half, with the game only really sprinting into life during the closing moments, when Mané had a couple of chances. One was snuffed out by a clearly determined van Dijk and the other was brilliantly tipped over by Forster. The second half did a passible impression of the Alamo, with van Dijk taking on the role of Davey Crockett, except that no-one died. 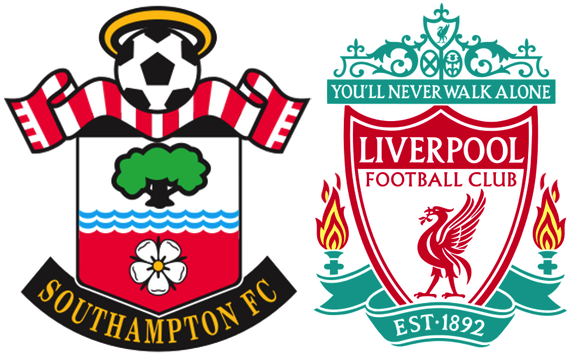 Liverpool were in complete control, but they just could not get past the determined and dogged defending of Saints. The visitors were clearly missing the influence and guile of Adam Lallana, who was out injured. Saints did have one tense moment, where it looked as if van Dijk had pulled Firmino back in the area, but replays showed that it was just outside and that the referee, Mark Clattenburg (another fan favourite), was exactly right in letting it go. The undoubted Man of the Match for Saints was Virgil van Dijk, who was a colossus at the heart of the defence and must have added a fair bit to his transfer value as well. After the match both managers were complimentary about each others teams, but I couldn't shake the feeling that Saints were damned lucky to come away with a point.